Salads get a bad rap. They can be healthy (or not), but they’re often lumped in the boring “diet food” category or derided as rabbit food. This salad will change your mind on all fronts: it’s served warm, it’s delicious, and it clocks in at less calories than your typical chicken Caesar. 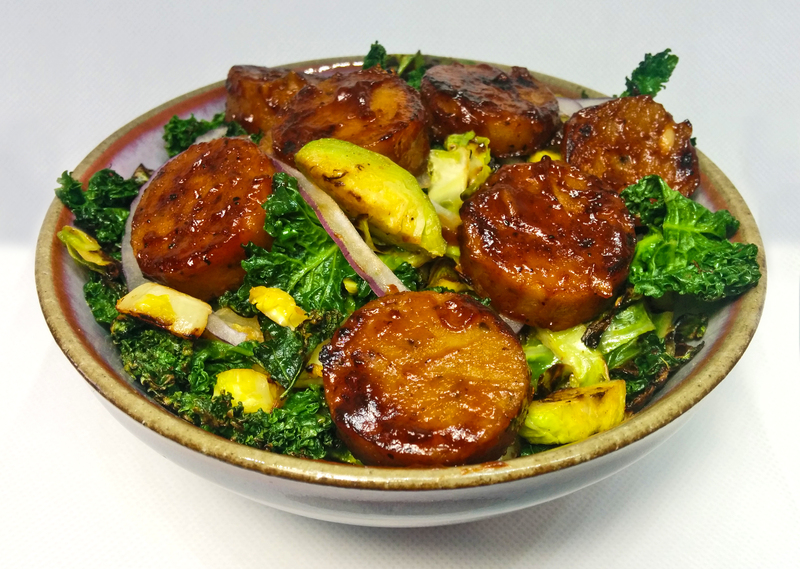 Roasted or pan fried kale and brussel sprouts make this nutrient-dense dish a great way to eat your greens. 1. Pull kale from stalks in bite-sized pieces. Add to a large mixing bowl. Drizzle olive oil over your fingertips and gently massage into the kale. 2. Halve brussel sprouts, then cut into 1/8-1/4″ slices until you reach the core. 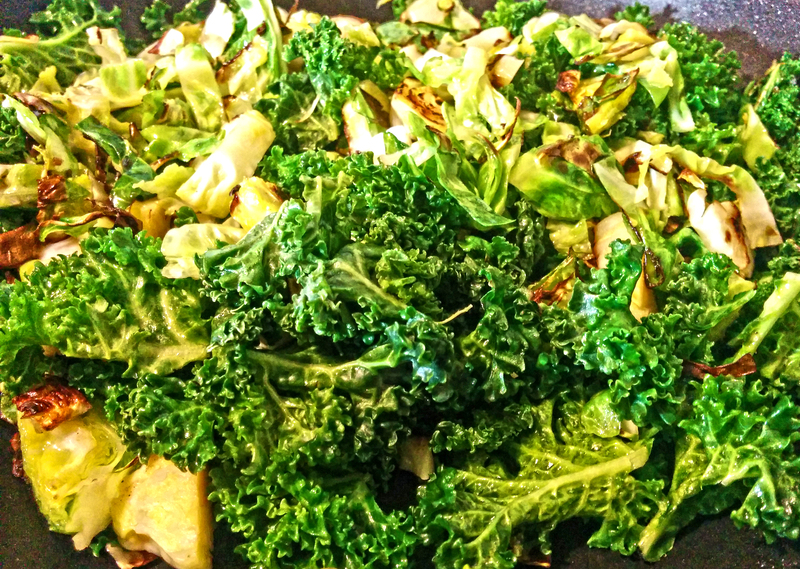 Discard stems and toss with kale, salt, and Solajo seasoning. 3. To roast: arrange greens in a single layer on a parchment-lined baking sheet. Bake at 425°F for 10-15 minutes, or until edges have started to brown. To pan fry: add oiled greens to a non-stick skillet. Fry over high heat until edges of brussel sprouts start to brown (about 2 minutes), then reduce heat and continue cooking until veggies are tender. 4. Slice sausage into 1/4″ rounds. Fry these slices in a non-stick pan over medium-high heat until browned, then turn off heat. Drizzle with barbecue or buffalo sauce. Toss/stir until pan cools slightly (this helps caramelize the sugars in the barbecue sauce). 5. Plate greens, add raw shaved onion, cheese, and hot sausage. Serve warm with a slice of lemon. *Sparrow Lane’s Basil & Garlic Olive Oil and Smelly’s Brunch Solajo Seasoning can both be found in our Garlic Lover’s Kit. Regular olive oil and garlic powder can be used in a pinch if you don’t have either on hand.